Help us eliminate hunger by enjoying great food for a special price all week! We (along with all other participating restaurants) will be offering a 3 course menu for $29.19. This year, $4.19 of every meal will be donated by the participating restaurants to this worthy organization that coordinates many critical hunger-relief programs including Meals on Wheels, the Kids Cafe, Mobile Pantry and weekend BackPack program. Call for reservations, book online or walk on in! 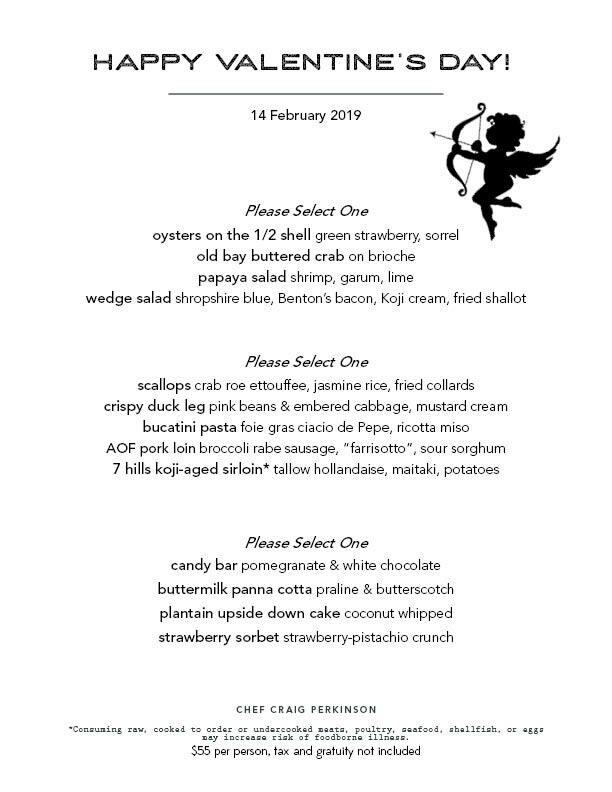 Join us Thursday the 14th for Chef Craig’s special Vday dinner! Drink specials too!! 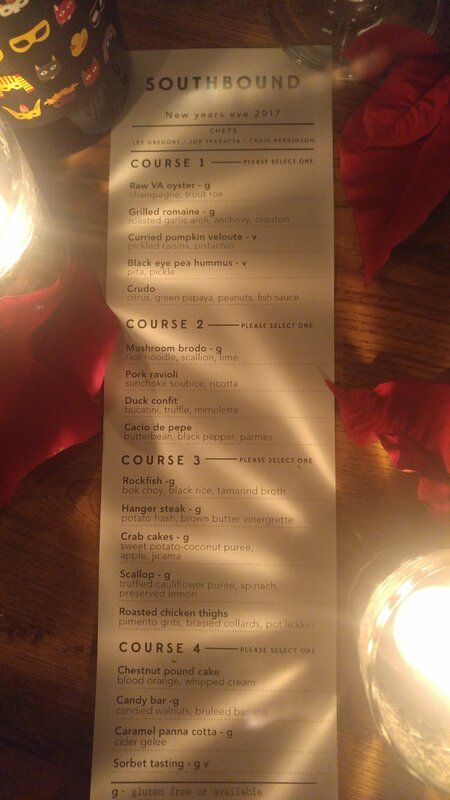 Bring your special someone to experience this specialty menu on this very special day. Call to make reservations. Limited seating available. Prix fixe menu will be $50 per guest. Champagne, wine, and specialty cocktail packages will also be offered. Please join us for a delicious cheers to the New Year with a special prefixed menu you don't want to miss. We will be open for both brunch and dinner services. Brunch: 10:30-2:00 pm. Dinner will begin at 5:00 pm. Our specialty menu is available for dinner only and last seating will be at 8:00 pm. We hope to see you there! 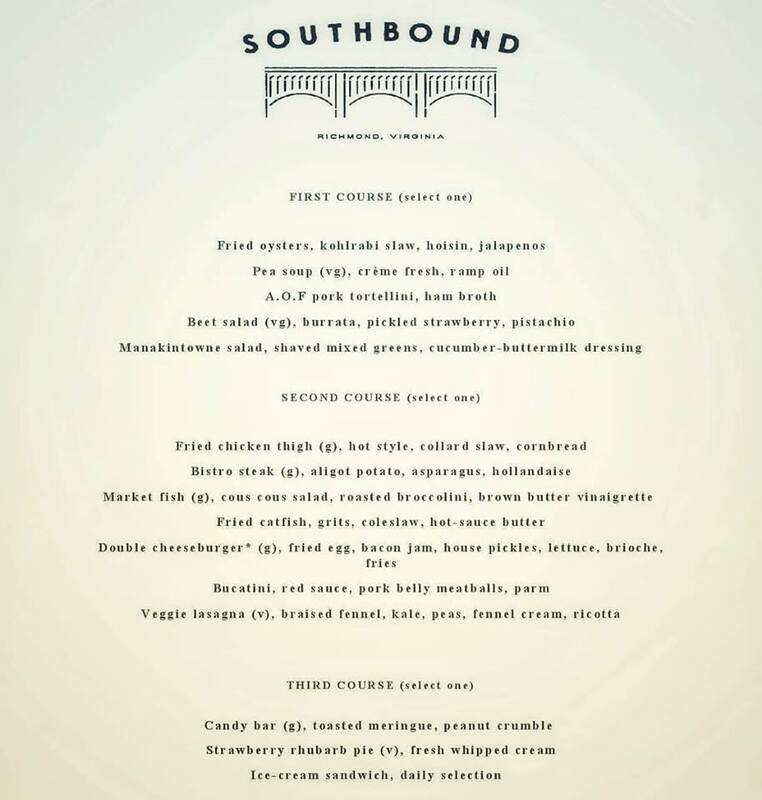 Please call Southbound at 804-918-5431 to make reservations, $50 per person (that does not includes taxes and gratuity) . Menu forthcoming. Please join us for this exciting evening (Thursday June 8th at 6PM) celebrating some very special wines from the team of winemakers who formed Envínate (Wine Yourself). The dinner will showcase their talents in wines made from regions all across Spain. Chris Barnes from Jose Pastor Selections and David Witkowsky of Potomac Selections will be present to guide you through these organic, traditionally made wines. The evening's line up exhibits the strong character of the region's terruño, think old vines, volcanic soil, high elevation, acidity, and you will begin to get the idea. Menu to be announced. Please call 804-918-5431 to make your reservation. $50.00 per person, exclusive of taxes and gratuity. On Envinate: "Their collective aim is to make profoundly pure and authentic wines that express the terruño of each parcel in a clear and concise manner. To this end, no chemicals are used in any of the Envínate vineyards, all parcels are picked by hand, the grapes are foot-trodden, and the wines are fermented exclusively with wild yeasts, with a varying proportion of whole grape clusters included. For aging, the wines are raised in old barrels and sulfur is only added at bottling, if needed. The results are some of the most exciting and honest wines being produced in Spain today." Join us on Thursday March 16th for a 5 course beer dinner with Answer Brewpub! $50 per person (excluding tax and gratuity). 7PM seating. Call the restaurant to make a reservation 804-918-5431. Menu coming soon.